Baby squirrels can be mischievous! Photo by Pablo Somarriba. Some wild animals can be affectionate and cute, especially before they reach sexual maturity. We are so often daunted by how many people want to promote the traffic in wild animals to satisfy their passion for making animals their pets. The wildlife of Nicaragua has been harmed by turning wild animals into pets. This week, we have taken in yet another animal that had fallen into the hands of some misguided individuals using the name "The Peace Project" who thought it would be fun to keep a Variegated Squirrel (Sciurus variegatoides) as a pet. This animal, however, is not a domesticated species, it is a wild animal. What kind of "Peace Project" steals wildlife from its natural habitat? This juvenile Variegated Squirrel covers himself with his tail to protect himself from predators from above. Photo by Laura Ruysseveldt. Several animals make good pets, especially dogs and even cows. These animals, after thousands of years of strictly close association with humans, can no longer live as wild animals. Instead of seeking an animal that lives well in its environment, however, many foreigners put wildlife in Nicaragua at risk of extinction by purchasing wildlife sold as pets from wild animal traffickers. Estacion Biologica recovered a Variegated Squirrel which had gotten ill from the abuse it had received in the hands of others. The squirrel was ill, weak, and infected with large sore on its side. The squirrel was very ill when we recovered him. He had a fever and a very large, pus-filled boil on his side. Our biology interns drained and cleaned his wound and assured that the squirrel received plenty of rest and nutritious food. Photo by Laura Ruysseveldt. Our interns drained and disinfected the sore, and gave the little guy lots of care and observation. Two days afterward, his disposition changed, he became energetic, curious, and confident. The illness began to subside. A Variegated Squirrel eats a ripe, juicy mango. Photo by Laura Ruysseveldt. Wild animals should live and die in their natural habitat, not as toys for humans. We are confident that this squirrel will get the opportunity to return to the wild soon, in spite of the abuse he received at "The Peace Project". We hope to see him running along the branches of the trees in Laguna de Apoyo Nature Reserve, with other squirrels, instead of captive to foreigners who treat him as a toy. 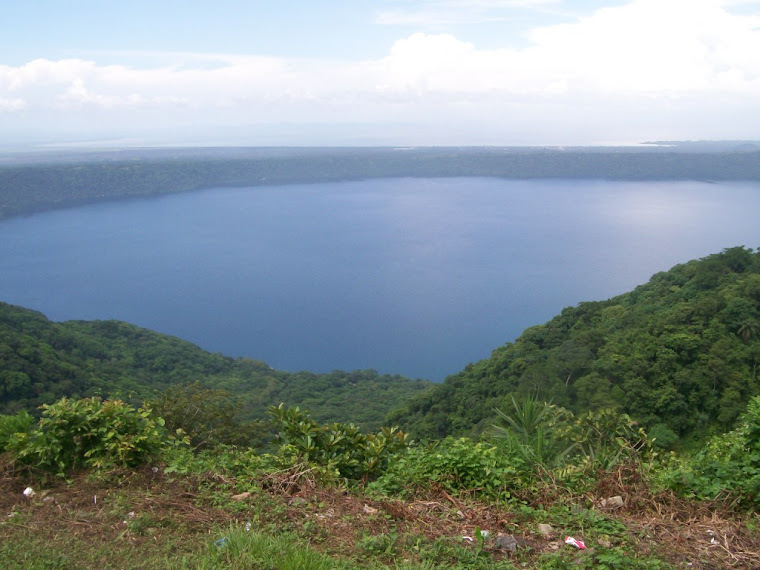 Would you like to work with us to protect wild natural resources in Nicaragua? Please contact us for more information on how you can help, whether in your home country or during a visit to Nicaragua. This baby squirrel quickly healed of his wound, although the hair returned slowly. He is still wild and living with the other squirrels in the trees above Estacion Biologica Laguna de Apoyo. Photo by Laura Ruysseveldt.